The tactical RPG genre is one that is, for the most part, fairly rigid. That’s no bad thing, of course, but it means I thought I knew what to expect from Grand Kingdom going in. I did not. This is a game that’s taken a well-established genre and turned it on its head, to great effect. For one thing, it’s as much a dungeon crawler as it is a TRPG. Rather than deploying a squad of units on a checkerboard battlefield and proceeding to move them turn by turn, Grand Kingdom’s battlefields are more like The Game of Life: snaking pathways that converge and reconvene to create something far more labyrinthine. You move about the map one space at a time and for every move you make, the enemies make their own. Restricted turn counts, siege weapons that put you at a disadvantage when fighting within their range, a “morale” stat that decreases with each encounter, and limited options for HP restoration mean that it isn’t always to your advantage to try and just eliminate all foes. Tactics come into how you navigate the battlefields: when to fight, when to avoid confrontation, and how to go about avoiding foes when you need to. Optional treasures, hidden shortcuts, and environmental hazards further complicate matters. Encounters themselves are just as fresh and tactical, as your squad and your enemies taking turns manoeuvring around three parallel, horizontal lanes. Simply running up to enemies and wailing on them soon stops being practical, as poor positioning and management of your fighters’ Action and Movement gauges will quickly lead to disaster. Using up all a unit’s Action gauge on strikes means big damage, but it’s often better to save some and for an end-of-turn defensive stance, or even to just guard off the bat to make your defence even harder to pierce. Like any tactical RPG, positioning is vital, but the three-lane setup puts a unique spin on common TRPG ideas. Being able to freely move along each lane, rather than being restricted to rigid tiles, means you’re able to fine-tune your positioning. You can use this to set up fairly complicated walls to protect your squishier characters, but still leaving just enough space for a rogue to sneak through and lay some hurt on anyone who tries to get close. The ability to lay down traps and blockades further extends your options, and all manner of area-of-effect attacks can help lead your squad to victory. These attacks can also lead you to a quick and unexpected defeat, because friendly fire is in effect in Grand Kingdom and its abandoning of tiled battlefields means it can be easy to accidentally hurt your own units if you’re not careful. Knowing the range and area of your fighters’ attacks is vital. Between all of this and some 17 different classes that are unexpectedly different and unique, even when they fill a similar role in combat, there’s plenty of depth to be found. Where Grand Kingdom really shines, though—and this is something I never thought I’d say—is multiplayer. As a general rule, I hate multiplayer modes in games. They’re often poorly designed and tacked on, but even when they aren’t, I usually find such modes to be tedious and frustrating. Grand Kingdom’s multiplayer mode, however, is brilliant. The premise of the game as a whole is that you’re the leader of a mercenary group within a war-torn land, and the multiplayer mode lets you take up contracts with any of the four nations of Resonail as they go to war. Each contract is for a specific number of wars, with lengthier contracts coming with greater rewards, and each war lasts 24 hours or so. Depending on your which nation you’ve contracted with, and who they’re at war with at the time, you’ll be pitted against players who’ve signed with enemy nations. Not directly, mind you—there’s no live multiplayer—but you’ll find against the AI-controlled squads of other players. Battles task you with vying for control of key targets on the map, with the assistance of siege weapons that you and other players deploy by vote. Depending on your performance in a given battle, you can look forward to great rewards, and possibly even being the kind of legendary mercenary of whom the bards sing about. Literally—when you visit a nation’s capital, you’ll hear bards singing the glory of those merc squads who are performing the best. Further to that point, multiplayer is seamlessly integrated into the rest of the game, more or less. Your choice of war contract affects singleplayer missions as well (though key story quests don’t change dramatically), and what kind of equipment you can buy from the four nations’ capitals. Your mercenaries are the same across all modes, and the experience, gold, and Royals (a type of currency) you earn is all the same. Really, multiplayer battles are just one of a handful of different mission types. 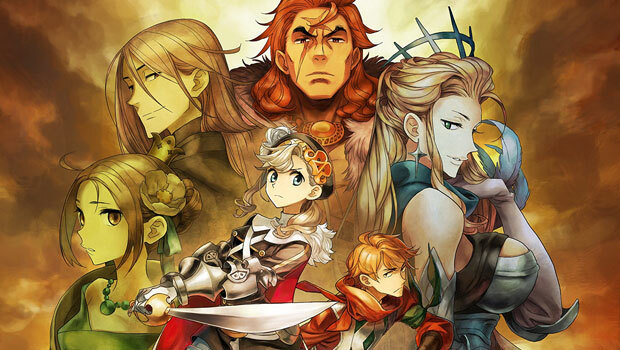 There has been a handful of games that have tried to integrate single- and multiplayer into one another, but Grand Kingdom is the first game I’ve seen to really do it well. This would be a fantastic TRPG even if it was purely singleplayer—fantastic combat and mission design ensure that—but the multiplayer aspect, and how cleverly it’s been implemented into the core of the game, is what really makes Grand Kingdom as grand as it is. Grand Kingdom is developed by Spike Chunsoft and published by NIS America. It’s available now for PlayStation 4 and PS Vita. A press copy was supplied by NIS America for this review.